Josh cares for his mother who suffers with mental ill health. He first accessed the project via a referral from his school due to issues raised by his father regarding issues both at home and in school due to his caring role. Our support worker identified that Josh really needed to get out of the family home and have a break from the problems he was. His confidence levels were very low and he did not like to meet new people. This made him very uncomfortable and socially isolated. Although reluctant at first, after a couple of months, Josh agreed to come along to our 12-17 year old youth club session. At first, he did not want to get involved but our support worker identified that Josh loved to play the guitar, so he got out a couple of guitars and they started playing; Josh really seemed to enjoy this. When Josh attended the next session he went straight to the guitars. We discovered that another of the Young Carers in the session played the drums so we also got out the drum kit and the two of them started playing together; you could see Josh’s confidence grow by the minute. Although the situation at home is still difficult Josh feels more able to cope as he is getting a break from his caring role, has new friends and has support from the service whenever he needs it.Young people can be classed as young carers even if they do not do anything practical or live elsewhere, as they can still be affected emotionally or need help to understand the condition of someone who has care needs. We are the Carers Trust Heart of England Young Carers Service in Coventry We provide support to 5-18 year olds who have a responsibility for looking after or helping someone else to look after a person who has a disability, a long-term illness, mental health illness, Autism/ADHD or someone addicted to drugs or alcohol. That person could be the young carers’ mum, dad, brother, sister, grandparent or even a close friend or neighbour. 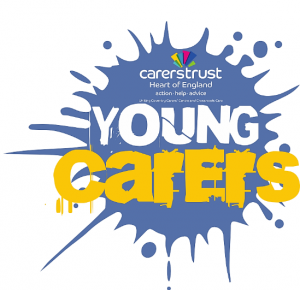 Young people can be classed as young carers even if they do not do anything practical or live elsewhere, as they can still be affected emotionally or need help to understand the condition of someone who has care needs. Young Carers may help out by going shopping, cooking, cleaning, making sure the person they care for takes their medicine, talking and listening to them when they are not very happy, looking after their brothers and sisters or anything else that helps out. Being a young carer can be a challenging aspect of life. Like many things, it has its negatives as well as positives. Many young carers have learnt skills their peers have not, and it also means they have had to grow up a lot quicker – sometimes assuming the role of a parent in the home. “…many five-to-ten year olds, known as infant young carers, are getting up at night to care for a sick family member. The BBC estimates that there are about 700,000 young carers in the UK, and in Coventry alone there are around 5,000. Sometimes young carers can face extra pressures and struggle to look after themselves, but it is important to take the time to look after their own well-being. There is information and help out there to make sure that they have emotional support and mental health and well-being support. We need to recognise the care work that children do and support them. Young Carers, Carers Trust, Heart of England supports young carers by listening when they want to talk, giving information and advice, arrange trips and activities to give them a break from their caring responsibilities and support them through any troubles they may have in school (if the problems are because of their caring role). It runs youth clubs, movie nights, skills-based sessions such as cooking, first aid, and we also do external trips to the cinema, bowling, theatre, to the seaside, theme parks etc. It helps young carers explore issues that are affecting daily life and support in enabling young carers to work out a way to deal with them. This gives them the opportunity to get things off their chest, work out solutions to any problems that being a carer may bring and find out about how Young Carers and other organisations in Coventry can help young carers. Schools can help by being more flexible in their approach to children’s attendance and submission of homework. Local authorities need to work with parents such that the parents don’t worry about their children being cast as exploited; the threat of social services getting involved can stop parents from seeking help for their children. We need to challenge the stigma of being child carers; this can alleviate their anxieties, allow them to form friendship networks and feel less isolated.